While violence rages on in Syria, Iraq and Afghanistan, the predominantly Muslim countries of the former Soviet Union — Kazakhstan, Kyrgyzstan, Tajikistan, Turkmenistan and Uzbekistan — are experimenting with secular governments and free markets. Their efforts have had many fits and starts, but the West should recognize that their struggle to come to terms with modernity holds huge potential for the Muslim world as a whole, and may someday serve as a template for promoting peace among warring nations. Yet Washington continues to underestimate their cultural importance and potential impact. In the tumultuous years after 9/11, America’s concentration on the Arab world seemed to make sense. After all, the Middle East was a source of Islam’s most virulent strains. Moreover, the importance of Mecca, Medina, Cairo and Jerusalem seemed to justify the assumption that the battle to win Muslim hearts and minds must be waged in that region. Presidents George W. Bush and Barack Obama both spoke glowingly of the Arab world’s spiritual and scientific contributions to humanity. Both men counseled the Arab people to embrace a “true Islam” that champions intellectual tolerance and embraces secular learning. But against their wishful words lay the reality that fewer foreign books were being translated and published in the entire Middle East than in Spain. Nor did either president seem to realize that, though many of the greatest geniuses of the centuries between the fall of Rome and the European Renaissance wrote in Arabic, most of them were not, in fact, Arabs. Thus, for many centuries, Central Asia — not the Arab Middle East — was the intellectual and political center of the Muslim world. The second holiest book of Islam, “Sayings of the Prophet,” was assembled by a scholar from Bukhara, in present-day Uzbekistan. It was in places like Kazakhstan, Tajikistan and Uzbekistan that Islam’s powerful mystical movement, Sufism, found its greatest exponents, and it was from there that Sufism spread across the Muslim world. And among medieval theologians, few thinkers stood higher than Abu Hamid al-Ghazali, from the city of Tus on the borderland between Iran, Turkmenistan and Afghanistan, who exerted a profound influence on St. Thomas Aquinas. Central Asia can also claim a lion’s share of the greatest names in Islamic science and philosophy. The codifier of algebra, to whom Mr. Obama referred his “new beginning” speech at Cairo University in 2009, was also from Khwarazm, in what is now Uzbekistan. Called Al-Khwarazmi in Arabic, he gave his name to algorithms, which lie at the heart of modern computer science. Also from Uzbekistan was Ibn Sina, known as Avicenna to the West, whose great “Canon of Medicine” gave rise to the medical sciences in the Middle East, Europe and India. Another great intellectual, Al-Farabi, who revived and greatly added to Aristotle’s logic and who wrote the greatest medieval study of music, was from what is now Kazakhstan. And the pioneering astronomer Abu-Mahmud Khojandi was from Khujand, now in Tajikistan. True, all these people wrote in Arabic. But a Japanese who writes in English is not an Englishman. All of them — and scores of other innovators from the Muslim world whom we are accustomed to think of as Arabs — belonged to various Central Asian branches of the Persian peoples, or were Turks, not Arabs. Today, the countries that are heirs to the old Silk Road are struggling to reclaim their heritage. The task is not easy. Many of their leaders are attracted to the authoritarianism that has brought relative stability to Russia and tremendous prosperity to China. The people of Central Asia have no prior experience with democracy, ethnic tensions persist, and many of their leaders rule with a heavy hand. Yet these countries remain secular states and are more tolerant of other religions than most of their counterparts in the Middle East. Their economies have grown steadily and they have embraced modern secular education, sending tens of thousands of youths to study abroad. They are developing new universities of their own, largely on the American pattern. Many use English as the language of instruction. And all can boast a rising generation of men and women drawn to the ideals of an open society. International media attention on the mass hunger strikes last spring propelled Guantanamo back onto the radar. A federal appeals court in Washington, DC recently ruled that Guantanamo detainees could bring legal challenges to their conditions of confinement. The court’s decision in Aamer v. Obama centres on an attempt by three detainees engaged in a hunger strike to obtain an injunction preventing the military from subjecting them to enteral force-feeding, a painful process in which liquid nutrients are administered through tubes stuck down the nose and into the stomach. Although the appeals court refused to issue the injunction, it said that judges had authority to hear a prisoner’s claims about his treatment at the detention centre. The ruling sends a mixed signal, highlighting the ambivalence of courts about their role in the long-running legal battle over Guantanamo. On the one hand, the decision marks another victory for the principle of judicial access. In 2008, the US Supreme Court ruled in Boumediene v. Bush that Guantanamo detainees had the constitutional right to challenge their detention through habeas corpus. The government, nevertheless, argued that Boumediene meant detainees could challenge only the legality of their detention, not the legality of their treatment in detention. Their conditions of confinement, the government maintained, remain within the discretion of the military. The DC Circuit rejected this restriction on judicial authority, finding that habeas corpus was sufficiently broad to encompass claims addressing conditions of confinement as well as challenges to the detention itself. The ruling thus paves the way for litigation on a host of treatment-related issues, including the government’s controversial policy of searching detainees’ groin areas, which is the subject of another case now pending before the appeals court. Aamer, however, stopped short of granting the detainees any relief. The Court held that the petitioners had failed to show a likelihood of success on their claim that the force-feeding protocol violates a constitutional right to be free from unwanted medical treatment. The court reached this conclusion by applying the legal standard for challenges brought by convicted prisoners – a standard that unsurprisingly offers wide latitude to prison officials. As described in the Supreme Court’s 1987 decision in Turner v. Safley, prison regulations may infringe on an inmate’s constitutional rights as long as the regulation “is reasonably related to legitimate penological interests”. In other words, as long as the regulation is not arbitrary or irrational, it stands a good chance of passing muster. The Turner standard is rooted not only in the perceived necessities of running correctional institutions, but also in the belief that those imprisoned for committing crimes deserve less constitutional protection. But herein lies Guantanamo’s enduring contradiction. Although the government has branded all the detainees dangerous terrorists, it has charged only a handful of them with a crime. As long as they have jurisdiction, federal courts can help ensure that conditions at Guantanamo remain humane for as long as the prison stays open. The contradiction of superimposing a standard meant for convicted prisoners on individuals whose confinement is supposedly nonpunitive – akin to the detention of prisoners of war – is even greater in Aamer since the three detainees there had been cleared for release, meaning the US government no longer views them as a threat to national security. The government supplied two justifications for its force-feeding protocol: Preserving the lives of those in its custody and maintaining security and discipline in the detention facility. The court found both persuasive. It explained that, absent force-feeding, prison officials had to choose between giving in to the inmate’s demands, which could cause other inmates to copy the same behaviour to manipulate the system to obtain a change in conditions, or letting the inmate die, which besides being a harm in its own right, could prompt a reaction from other inmates that jeopardises institutional security and safety. The reality is that hunger strikes are a public relations nightmare for the United States. They have an unparalleled ability to focus the world’s attention on the ongoing plight of men held for more than a decade, men whose situation is so desperate they would rather starve themselves than go on living in legal limbo. Indeed, it was the international media attention on the mass hunger strikes last spring that propelled Guantanamo back onto the public radar, causing President Barack Obama to reenergise his moribund efforts to repatriate prisoners and close the detention centre. Force-feeding may help maintain internal discipline. But it is also meant to break the hunger strikes and avoid the embarrassment of more fatalities at the prison camp, where nine prisoners have died already. Although the appeals court refused to grant the detainees any relief in Aamer, it did leave the door ajar to new challenges down the road. It suggested, for example, that the detainees could attempt to show that even if force-feeding is not inherently unconstitutional, the current protocol is being applied in an unconstitutional manner because it subjects detainees to this treatment before they are at risk of death. While judges cannot ban force-feeding outright, they may require that it be applied in a manner that shows greater respect for the autonomy and humanity of the detainees. Keeping courthouse doors open is important. It allows judges to rein in government officials when they go too far, as they have repeatedly done in the war on terror. The Supreme Court, for example, had an important hand in eliminating torture and ensuring that baseline protections of the Geneva Conventions apply to all individuals in US custody, including suspected terrorists. But judicial review of prison conditions will have only a limited impact. Aamer’s adoption of the same deferential standard courts apply to lawsuits by convicted prisoners will make it difficult for detainees to prevail. More fundamentally, litigation over prison conditions will not alter underlying reality of indefinite confinement at Guantanamo. It can only make the unbearable a little less unbearable. Jonathan Hafetz is Associate Professor of Law at Seton Hall University School of Law and the author, most recently, of Habeas Corpus after 9/11: Confronting America’s New Global Detention System. WASHINGTON — President Obama, apparently resigned to President Hamid Karzai’s refusal to sign a long-term security agreement with the United States before he leaves office, told him in a phone call on Tuesday that he had instructed the Pentagon to begin planning for a complete withdrawal of American troops from Afghanistan by the end of the year. But in a message aimed less at Mr. Karzai than at whoever will replace him, Mr. Obama said that the United States was still open to leaving a limited military force behind in Afghanistan to conduct training and counterterrorism operations. Noting that Mr. Karzai had “demonstrated that it is unlikely that he will sign” the agreement, Mr. Obama told him, in effect, that the United States would deal with the next Afghan leader. He warned Mr. Karzai that the longer it took for Afghanistan to sign the pact, known as a bilateral security agreement, or B.S.A., the smaller the residual force was likely to be. It was the first time the leaders had spoken since last June, and for all intents and purposes, it marked the end of a relationship that had long since broken down in acrimony. While Mr. Obama’s message was not a surprise — administration officials had concluded weeks ago that any agreement would probably come only after elections in April — the White House’s blunt description of his call with Mr. Karzai underscored the depth of the president’s frustration and the erosion of trust in the Afghan leader. But the call also confirmed that the White House has retreated from its earlier insistence that the Afghan government sign the agreement before the elections or face the threat of a total pullout. “Clearly, the president is putting pressure on Karzai without closing the door on B.S.A. just as he is preparing the ground for the possibility that B.S.A. may not happen,” said Vali Nasr, the dean of the Johns Hopkins School of Advanced International Studies. Indeed, in the call with Mr. Karzai, Mr. Obama made clear that he views a residual force as a way to prevent Afghanistan from becoming once again a haven for terrorist groups. “Should we have a B.S.A. and a willing and committed partner in the Afghan government, a limited post-2014 mission focused on training, advising, and assisting Afghan forces and going after the remnants of core Al Qaeda could be in the interests of the United States and Afghanistan,” the White House said in a statement issued after the call. The White House had hoped to seal the security pact before a meeting this week of NATO defense ministers in Brussels, where Defense Secretary Chuck Hagel plans to discuss the logistics of the American troop reduction in Afghanistan and the shape of a potential postwar force with other alliance partners. Military planners have faced deep uncertainty in preparing for a mission to train, advise and assist Afghan forces after combat operations officially end this year. The governments of nations that contribute troops must approve any sustained deployments months in advance. The major candidates for president in Afghanistan have all signaled they would sign the security agreement. But if history is any guide, the April election might necessitate a runoff, which could lead to months of political uncertainty, further delaying the security deal. A senior administration official said Mr. Obama was sending a message to Mr. Karzai that there would be a cost to further delays, both in the rising chance that the United States might go down to zero troops and in the more limited size and scope of a residual force. Mr. Obama’s decision to look beyond Mr. Karzai, the official said, was driven by Mr. Karzai himself, who has told the administration that he believes his successor should sign the agreement because the future government will have to live with its consequences. But he declined to give another deadline for when the United States must decide that it will go down to zero. Some Afghanistan experts have criticized Mr. Obama for imposing deadlines, given the mercurial nature of the relationship between him and Mr. Karzai. For all the tough talk, few people in the Obama administration are willing to say publicly that they believe leaving no residual force behind is a good idea, in large part because of the fear that without any American or NATO troops, Afghanistan could revert to its status as a staging ground for terrorist plots against the West. “The preponderance of opinion across the government is that some reasonable post-2014 presence in Afghanistan is necessary to lock in our very hard-fought gains,” Michelle Flournoy, a former top Pentagon official, said in an interview. Faced with continued uncertainty, American and NATO commanders have drawn up plans to deploy a force this summer that is tailored to assume a training mission in 2015 but also small enough to withdraw, if no deal for an enduring presence is reached. The plan would give Mr. Obama and other political leaders maximum flexibility. Some analysts said the administration erred by tying the decision on troops too closely to its relationship with Mr. Karzai, which became toxic this month after Afghanistan released 65 prisoners that the United States said had the blood of American soldiers on their hands. Mark Landler reported from Washington, and Helene Cooper from Newport News, Va. Thom Shanker contributed reporting from Washington. 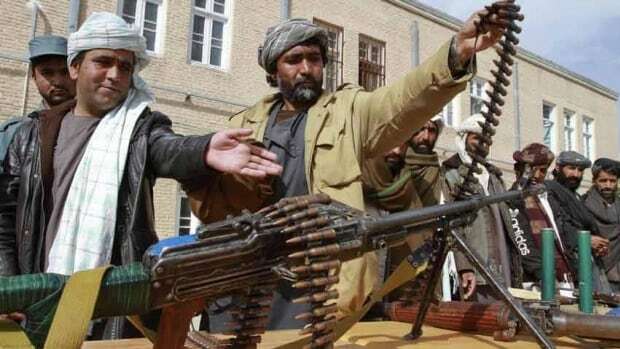 Former foreign secretary Riaz Mohammad Khan fears that some in Pakistani establishment could still be harbouring the misplaced hope of seeing Taliban return to power in Kabul and warns against exaggerating apprehensions of growing Indian influence in Afghanistan. Speaking at the Institute of Strategic Studies, he said there could still be temptations of the option of “strategic depth” for countering Indian ingress in Afghanistan. “This notion exists in our psyche and is based on the hope that Taliban could return to power and we can have a friendly and pliant government in Afghanistan,” he said, adding that Pakistan had remained hostage to the thought that Taliban were its assets. The country, he warned, would face an “escalating cost” for any assistance given by non-state actors operating from its territory to Afghan Taliban. Thirty years were long enough for a nation to learn lessons but Pakistan had still not learnt a lesson from Afghanistan, he said. Mr Khan, who headed the Foreign Office from 2005 to 2008, stressed the need for assessing if a “Taliban option” still existed. Taliban stood little or no chance to return to Kabul, he said, adding that Taliban leaders were never ready to do Pakistan’s bidding. The seasoned diplomat said Pakistani Taliban always claimed that they obeyed Afghan Taliban chief Mullah Omar but neither he nor any other Afghan militant thought to be friendly to Pakistan denounced violence perpetrated by them or asked them to stop it. Mr Khan warned that return of Taliban to power in Afghanistan would promote extremism in Pakistan and the emerging scenario would be graver than Indian influence in Afghanistan. He cautioned against over-stating the fears of Indian influence in Afghanistan for justifying the Taliban option. Indirectly advocating an Indian role in Afghanistan, he said positive stakes of regional countries in a stable and peaceful Afghanistan served Pakistan’s interest. He said Pakistan faced no conventional threat from the western border (with Afghanistan) due to demographic overlap and intractable geographic terrain. But a non-conventional threat is there and Pakistan is already facing it in the shape of militancy. Mr Khan called for formulating a clear narrative on Afghan policy, Taliban and relations with the Afghan government. Pakistan, he advised, should proceed with confidence that a stable Afghanistan was in its interest. The tragedy that struck a Kilo-class submarine of the Indian Navy early on Wednesday snowballed into a national disaster by evening as Navy Chief Admiral D.K. Joshi's resignation was accepted by an apparently miffed Defence Minister A.K. Antony. A spate of mishaps and accidents have plagued the Navy of late, and Antony's rather quick acceptance of Admiral Joshi's resignation was widely criticized, especially by serving and retired defence personnel. The series of unfortunate events that culminated in the first-ever resignation of an Indian Navy Chief began unfolding about 100km off the Mumbai coast early on Wednesday, when a fire incident in the submerged INS Sindhuratna, a Russian-origin diesel-electric submarine commissioned in 1988, ended in the emergency airlift of seven affected sailors. Two officers were reported missing. By evening, Admiral Devendra Kumar Joshi had written a terse no-nonsense resignation and walked across the South Block corridor from his office to the Raksha Mantri's. Sources said the Admiral was visibly upset, and wanted to be relieved immediately. One source said Antony, who was not happy with the Navy's recent accident track record and the "rigid" approach of the chief, did not spend much time in deciding the fate of the admiral, and accepted the resignation. 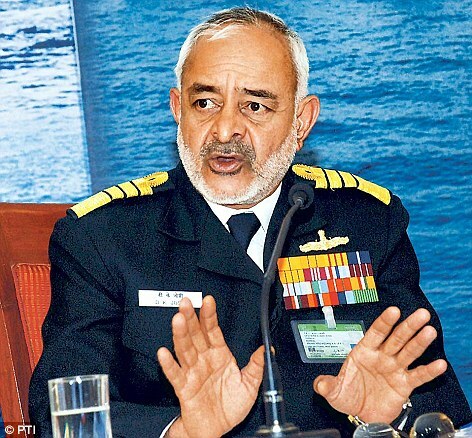 In his resignation letter, Admiral Joshi said that though the government continued to repose faith in his capabilities, it was becoming untenable for him to continue as head of the maritime force in terms of accountability. "I have the honour to refer to recent incidents/accidents during the past few months that have impacted the professional image of the navy. While the government has continued to repose its fullest trust and confidence in the service, I consider my continuation as the chief of naval staff as untenable," he said in the resignation, adding that he accepts "fullest moral responsibility in the interests of accountability". Joshi, who took over as Chief of Naval Staff in August 2012, was due to retire on August 31, 2015. A government communiqué said that Vice Chief of Naval Staff Vice-Admiral R.K. Dhowan will be discharging the duties of Officiating Chief of Naval Staff pending appointment of a regular chief. The admiral's action evoked a massive response. Former Navy Chief Admiral Sureesh Mehta said that accidents are a way of life when it came to submarines and aircraft. "The chief is not responsible for them. There are other people who are directly involved in day to day activities," he said. Those who know Admiral Joshi well said his action was not surprising, though Antony's quick acceptance came as a shock. "Not surprised to hear this as Admiral Joshi is a man of honour and is known for leading an austere life. If the government had slightest decency it would have turned down his resignation," said Rear Admiral (Retd.) Raja Menon. A senior serving officer said that it was a tragic day for the armed forces as the axe has fallen on the admiral who took responsibility for accidents. The same response is not expected from those in other spheres, including politicians, he said. The Sindhuratna, which had recently been refitted after being in service for over two decades, was undergoing acceptance trials when smoke filled the third compartment that houses sailors, the vessel's galley and its battery pit. 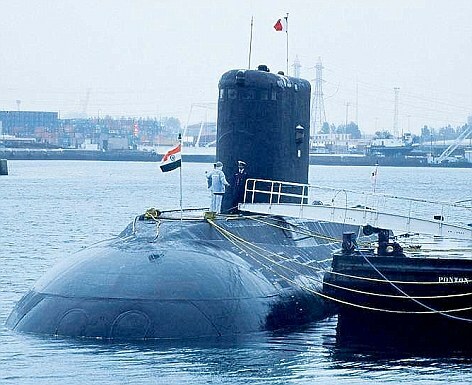 The second submarine accident after the sinking of INS Sindhurakshak, another Kilo-class submarine that was rocked by explosions in August last year killing 18 personnel, jolted the naval establishment and the reverberations were felt right to the top. As the details of INS Sindhuratna accident trickled in, it remained unclear if the smoke was triggered by an explosion or fire on-board. The third compartment was locked immediately and rescue operation commenced with the submarine surfacing immediately. A Seaking helicopter and other warships in the area were sent for the rescue, said officials. The submarine was ventilated and brought back to Mumbai on its own power. The Navy said all the sailors who were hospitalised were out of danger. The Navy also clarified that there were no weapons aboard the Sindhuratna. 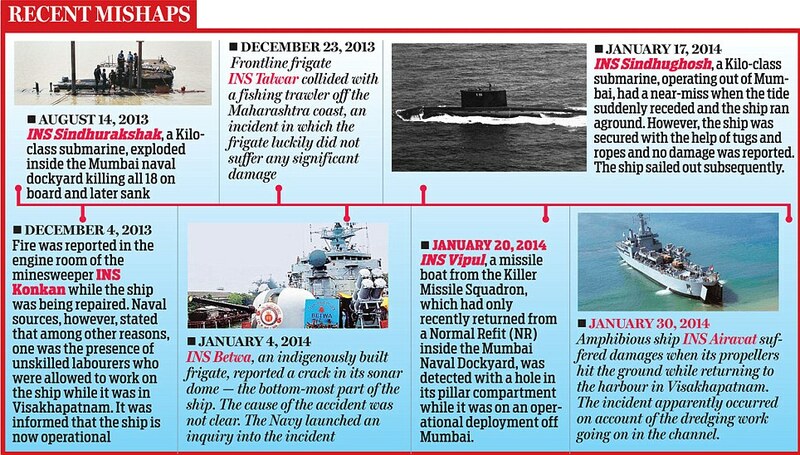 The Navy is yet to get to the bottom of the INS Sindhurakshak tragedy. The navy has only recently signed a Rs 240-crore contract with a US-based company for the salvage of the sunk vessel. Following Admiral D.K. Joshi's resignation taking moral responsibility for the series of incidents involving the Navy, questions are doing the rounds that should the buck not stop with "Mr Clean", Defence Minister A.K. Antony? Here we take a look at some of the controversies that have come to mark his tenure at the defence ministry. Antony was cornered in Parliament over his inaction when he was told by the then Army Chief General V.K. Singh that he was offered bribe by a fellow general. When the AgustaWestland scam hit the headlines, he deflected the kickback taint and refrained from taking moral responsibility. Antony committed a faux pass in Parliament over the killing of Indian soldiers on the LoC. He said that militants dressed in Pakistan Army uniforms had crossed the LoC. He never owned up to delays in defence modernisation and indecision on key acquisition projects. People Are True “Strategic Assets” of Pakistan, Not Taliban! Now, the Pakistan Air Force is committing air striking in North Waziristan against the terrorists. By now, more than 50 terrorists have been killed. The on-going strikes from the Armed forces, is the retaliation of the brutal murders of its 23 FC men by Taliban extremists. It was surely the same brutality that altogether changed the mood of both Pakistan Army as well as the Federal government. But despite seeing the beheaded bodies of our soldiers, the Taliban supporting parties are still demanding the government to stop the action in the name of restoring “peace talks”. Ever since the statement as well as the video officially released by Taliban`s sub-group (later on also owned by TTP) came up, government officials, politicians, media and analysts have been condemning it. However, a very important thing that has been totally ignored by them is the fact that our 23 FC soldiers had been missing for about four years, i.e., since 2010. This is extremely astonishing aspect of the tragic incident which has definitely raised some important questions. It is an open secret that it was the TTP`s massive terrorism all over the country that forced the state of Pakistan to sit on the table not to have contemporary negotiations, but practically to accommodate the Taliban`s demands in order to avoid further disaster. And of course, one of the directly or indirectly conveyed demands from TTP to the government is to release their arrested fellowmen. For sure, it is a very common tactic of war to pressurize rivals so that he can get compelled to accept your demands. Taliban did the same. But, the question is, why did the government and its armed forces not adopt the same approach against TTP so that they could get released the kidnapped FC`s personnel? Furthermore, Taliban did not reply on only this, they also took a very bold step and formulated a strategy to get their arrested people released by themselves. Following the same, they attacked the Bannu jail and very successfully took their high profile terrorists along with them. The question arises here is, when terrorists can dare to take so bold steps against the state, why couldn`t our armed forces do so? Was it difficult for them to launch similar, rather better, operation in the TTP- held areas and get their abducted soldiers released? More importantly, Iran has just warned the government of Pakistan to get its abducted border security soldiers released at the earliest. In the other case, it could send its forces in Pakistan for this purpose. It should be kept in mind that the Iranian border personnel were kidnapped in the current month of February. Now, the question is, when a neighboring country is ready to send its forces in the other country (Pakistan) for the release of its people without any delay, was North or South Waziristan beyond the reach of our government and its armed forces? Did Pakistan need to seek any prior permission to enter its borer areas before it could launch any targeted or surgical operation to recover its people? When truly no, then why did the politically elected governments as well as the military establishment wait so long till they received the video of their beheaded soldiers? Now, who would come up to take the responsibility of losing our 23 FC personnel? Very frankly speaking, no one has any doubt about that the Pakistani armed forces have the capability to very soon eradicate the TTP monsters from the entire country. But, what is emerging is that a part of our military establishment, as some retired officers of the Army, IB, ISI, MI have already expressed their views this way, is still of the opinion that Taliban and its sub-groups are “Strategic Assets” of Pakistan which can be used against our neighboring enemies in case of war. However, can Taliban, who neither hesitate to shred our innocent people through suicide attacks, nor do they ever repent after beheading our solders, be considered our Assets anyhow? Of course not! We have just witnessed a massive pubic rally in Karachi to express solidarity not with only Armed forces, but also with the FC, Rangers, Levies and the Police who are fighting against the anti-Pakistan elements. This rally was highly important because of two aspects. Firstly, it was organized by the party (MQM) which became victim of the Army operation not only in the past, but is also once again facing similar situation form the Rangers and Police. Yet, it has given a very loud and clear message to the soldiers that it is standing with them in the on-going war. Secondly, these are the common people who have already faced the TTP`s terrorism directly or indirectly, yet they came up for the sake of paying a tribute to their own forces against the inhuman elements. In fact, it was their loyalty and the deep respect that they were extending to their armed forces. Can Taliban who neither give dam care to the state of Pakistan nor do they have mercy for its citizens, ever be compared to the patriot Pakistanis? No Never! The Taliban`s butchery has no match with the patriotism and profound love of the Pakistanis for the country and its armed forces. Therefore, whoever, whether in the government or military establishment, still considers Taliban as Pakistan`s strategic assets, must revisit his view and the resulted policies accordingly. Otherwise, it will be a great disappointment for the people which will not benefit Pakistan at all. Two recent events highlight Israel’s potential role as an arms supplier to South and Southeast Asia. Israel has once again enjoyed a very significant presence during the recently concluded Defexpo, held in New Delhi, and Singapore Airshow. Not only did it show off its state-of-the-art weapons systems; the diminutive state was able to clinch a few important deals with countries in the region. The participation of aconsiderable number of defense firms, both state-owned and private, itself is an indication of Israel’s desire to forge closer military-security cooperation with countries such as India, Singapore and Vietnam. The Asia-Pacific is looking an increasingly attractive market for Israeli arms manufacturer, especially as other major countries cut defense spending. For instance, major players such as Israel Military Industries reportedly secured contracts with several Asian countries worth $500 million during 2013, mostly for upgrades of military platforms, sales of heavy munitions, and a variety of military systems. Several important joint-ventures are also underway. Despite India’s announcement that it would focus Defexpo 2014 on home-grown products, the Israeli pavilion attracted a sizeable audience, including defense planners. During the show, Israel Aerospace Industries (IAI)showcased new products, such as the Katana unmanned ship, advanced radar systems, air defense systems and command-and-control gear for various theaters, including cyber. IAI subsidiary Elta Systems also unveiled its unique and advanced Combat Team Battle Management System (CT-BMS), which that could be useful in addressing the challenges of tactical command, control, collaboration and real-time situational awareness. Similarly, Elbit Systems, for the first time, introduced TREASURES, a UGS system for continuous force or border protection. This system was officially launched during Singapore Airshow 2014. Israel’s Rafael also exhibited products, such as its Iron Dome missile defense system and Spike anti-tank guided missiles. During mid 2013, New Delhi again considered procuring the anti-missile system. While at first Indian officials were hesitant to commit to Iron Dome, on the grounds that it would be ineffective for India’s long borders and congested air space, Israel’s willingness to share the sophisticated technology behind the system is altering India’s thinking. So although no major arms deals were announced during the Defexpo, this plan to jointly build an integrated anti-missile system was certainly one highlight. The contract, which is likely to be signed within the next six moths, would see collaboration among India’s DRDO, state-owned Bharat Dynamics Limited (BDL) and Bharat Electronics Limited with IAI and Rafael. With IAI and Rafael cleared of bribery suspicions, military cooperation between India and Israel is set to rise. Israel also made a strong presence at the Singapore Airshow this year, which was attended by Israeli Defense Minister Moshe Yalon, several other military officials and dignitaries from various defense industries. 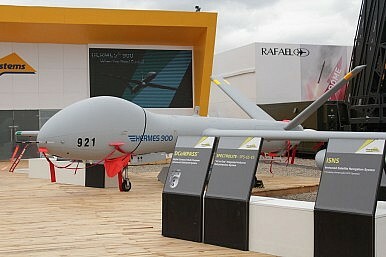 At the show, Elbit exhibited its Hermes 900 Unmanned Aircraft Systems and ANVIS/HUD 24 featuring line-of-sight, in addition to TREASURES. Alongside these systems, IAI’s revamped Super Heron Heavy Fuel drone, which can stay airborne for about 45 hours, attracted considerable attention. Meanwhile, amid growing concerns over cyber security, IAI’s Elta has decided to launch a new research and development center in Singapore, the first of its kind in the region. Singaporeans will comprise about 80-90 percent of the workforce, benefiting local scientists, engineers and professional computer analysts. This joint project with Singapore’s Economic Development Board signals a transformation of relations from seller-buyer to collaborators. Countries like South Korea and India are also likely to benefit from this R&D program. Rafael Advanced Defense Systems again impressed by unveiling its Iron Beam high-energy laser system, which is designed to defeat rockets, mortars, and UAVs at short ranges. Israel has started with this program—still in the developmental stage—to combat missile threats from its neighbors. Vietnam is another potential market for Israeli arms. For instance, Israel Weapon Industries has established a production facility in Vietnam to help supply Galil ACE 31, 32 assault rifles to the Vietnam People’s Army. Given Vietnam’s large army and obsolete weapons systems, Israel could one day be involved in upgrading the Asian country’s defense systems and its technologies. These developments suggest robust military-security cooperation between Israel and Asia, a marriage of Israel’s willingness to transfer military technologies and the military modernization and upgrade programs of South and Southeast Asian countries. Alongside economic incentives, bilateral relations between these countries will continue to be driven by close defense ties and shared national security challenges. Israel’s interest in these potential defense markets is clear from its willingness to unveil its latest technologies. Although competition is likely to emerge, particularly in the field of drones, for some time to come, Israel will remain an important supplier. Civilian deaths have sadly become routine in Syria, but they are not always powerfully photographed and presented to Western readers — despite a nearly constant flow of cell phone images out of the country. Abdullah Omar is 20 years old, and works as a translator. On Sunday, he became one of the many amateur photographers of the Syrian conflict when a devastating car bomb went off in the Syrian border-town of Atmeh, damaging the hospital where he works. Omar also witnessed the strange scene that followed, as those rushing to help quickly turned on one another — a reminder of the complexity and deep divisions among Syria’s rebel factions. He has given GlobalPost permission to publish the photos he took. — just months old — along with the baby’s mother and brother. Omar’s pictures show the boy being rushed from the scene. Tragically he died shortly after on route to hospital. A woman in purple, the boy’s grandmother, was injured in the blast. A picture shows her shoeless and in shock as her son, who had just lost his entire family, attempts to console her. “At least 14 were killed in this massacre. We, and the other hospital, did refer some patients to Turkey due to critical injury so we don’t know anything about these patients yet. Maybe this number is higher now,” Omar said. As with so many tragedies in Syria, it is not yet clear who is responsible. Atmeh, whose pre-conflict population was just 5,000, is now home to anestimated 30,000 displaced Syrians who live in tents along the Turkish border. In addition to refugees, the town’s population is augmented by rebel groups ranging from secular Free Syrian Army to al Qaeda-affiliated extremist groups and foreign jihadists that use the unofficial border crossing to bring in reinforcements and supplies. In recent months the town fell largely under the control of notorious extremist group ISIS. But as 2014 began, an Islamic coalition that includes al Qaeda-linked Jabhat al Nusra joined forces to oust ISIS from Atmeh, Aleppo and other areas of Northern Syria. They now control the town along with groups from the FSA. While no one has claimed responsibility for the blast, many are blaming ISIS. Others blame the Syrian regime. “Everybody is blaming ISIS, not because they are who did it but because they are like the government — they are easy to blame. But nobody knows the truth,” said Basel Almasri, a Syrian refugee now working on rehabilitation for injured Syrians in Turkey and Syria. Witnesses said foreign and local fighters from extremist groups were the first on the scene to assist the injured. But the frantic and tragic atmosphere led to accusations as FSA members arrived. Omar described how shots were fired in the air as extremist fighters, in particular non-Syrians, were chased from the scene. Locals say the atmosphere in Atmeh remains tense. The brief unity between the various rebel factions that prevailed over ISIS has been dealt a blow. Distrust is high. To date, the Syrian conflict, which is about to enter its third year, has killed more than 140,000 and displaced over nine million Syrians. While 2.5 million live as refugees in neighbouring countries, a further 6.5 million have fled areas of heavy conflict to towns like Atmeh and now live in appalling conditions in tents or in over-crowded homes, according to USAID figures. Federal Minister for Interior and Narcotics Control Chaudhry Nisar Ali Khan has said that the level of cooperation between Pakistan and the UK should be raised a notch higher. He said this while talking to Charles Farr, Director General of Security and Counter Terrorism, UK, who is representing the UK delegation at the Pak-UK Joint Working Group, here on Tuesday. The minister said that Pakistan and UK enjoy extremely good relations and understanding but we need to enhance both the level and speed of the cooperation that exists between the two countries. He said narcotics, terrorism and serious crimes have now become transnational issues. It is, therefore, of the utmost importance that the countries work together to negate the ulterior designs of the criminals and terrorists. Charles Farr assured the Minister of UK’s full cooperation in combating terrorism and militancy in Pakistan. He also briefed the minister about various important issues which came under discussion during the morning session of the Joint Working Group held in the Ministry of Interior including organized crime, strengthening legislation, illegal migration, human trafficking, narcotics, forensic science and IEDs as well as training and capacity building of law enforcement agencies. A day after the government tried to assure the Senate of no policy shift on Syria, it followed suit in the lower house on Tuesday as it “vehemently rejected” media reports on a foreign policy U-turn. Adviser to the Prime Minister on National Security and Foreign Affairs Sartaj Aziz made a policy statement in the National Assembly and clarified that it was not going to sell arms to Syrian rebels under Saudi influence. He referred to the joint statement issued during the visit of Saudi Crown Prince Salman Bin Abdulaziz and said the two sides reiterated the need for finding a quick solution to the existing conflict in Syria according to the Geneva I Resolution. Both sides called for: the importance of immediate withdrawal of all foreign armed forces and elements from Syrian territory; lifting siege of the Syrian towns and villages and stopping aerial and artillery bombardment; the setting up of safe corridors and regions to deliver food and humanitarian aid to besieged Syrian citizens under international supervision; and the formation of a transitional governing body with full executive powers enabling it to take charge of the affairs of the country. But Aziz’s policy statement fell short of satisfying the opposition. “There is an operation going on in our own country and you are meddling in affairs of others,” he decried. Qamar reiterated that Pakistan’s position had been to stand neutral over the Syrian crisis. Endorsing his views, Pakistan Tehreek-e-Insaf’s Dr Shireen Mazari said that asking for a transitional government was a big shift in foreign policy, which was not in the country’s national interest. She said foreign policy should not be moulded under the influence of allies. Pakistan is making extensive and precise use of its own indigenous drones in the current surgical strikes against the Taliban, security officials and experts confirmed on Tuesday. A top official said ground intelligence, combined with accurate data by the Pakistani drones, had made it possible to take out the TTP targets in Tirah and Mir Ali recently, creating a scare among the TTP ranks not seen before. Sources in Islamabad say the telephone chatter after these strikes had shown that the Taliban were in disarray as they were telling each other if such precise strikes continued, they would be eliminated without even a fight. A senior security official, when asked by me whether in the latest touch and go visit by the CIA chief Brennen to Rawalpindi, had the Pakistan Army asked for intelligence help from the US drone apparatus to pinpoint the TTP hideouts, the response was ‘no’. The official was referring obviously to the capability Pakistan had announced in 2012 and confirmed in November 2013 when two locally-produced drones were displayed at an arms exhibition in Karachi. “The development of the drones, thought to have a range of about 75 miles, represents a milestone for the country’s military and scientists,” the Post quoted Pakistani and Western analysts. “It is a landmark and a historic event, wherein a very effective force multiplier has been added to the inventory of the armed forces,” the Pakistani military then said in a statement. Pakistan’s military first revealed its drone technology at a trade show in 2012, but in November last year the formal unveiling coincided with an ongoing farewell tour by Gen Kayani, who was retiring after two terms as army chief, the Post reported. Brig Muhammad Saad, a former senior officer in the Pakistani military familiar with the subject, was quoted as saying that the country already had less-sophisticated drones for intelligence gathering, with a range of about six miles. Experts say Pakistan is still years away from being able to develop armed drones but Washington Post quoted Peter W Singer, a security analyst at the Brookings Institution, saying most surveillance drones can be armed, though they will lack the precision of US-developed models. In November of 2012, London’s Guardian newspaper reported that military officials had briefed some of Pakistan’s closest allies about efforts by the army to develop its own combat unmanned aerial vehicle (UAV). But now it is 2014 and the Pakistan Army has as many of these birds as it needs. This will be the latest and the most effective tool in this fight against terrorism. The Army today, steps in the right direction? Even though they say that the only thing tougher than putting a new idea into an army is taking an old idea out of it, the army adapts. The army evolves. And from what we are seeing develop from the slums of Manghopir to the nullahs of Mirali, it seems that, operationally, this army is getting its cake and maybe eating it, too. The confidence is contagious. They’re ready, they claim, for most of what’s coming their way. Their media game: spot on [remember Major Jahanzeb’s funeral last week? It was all over the TV map]. Their optics: excellently timed [the COAS visiting the FC HQ at Balahisar days after Frontier Corps men were massacred by TTP Mohmand, which essentially triggered the end of the peace talks]. As for their day job, actual mil-ops: ask any one of them and they’ll tell you that they’re a ‘different’ force. And if you ask the right questions, they might back up with some claims, too. Claim One: This army is a very dissimilar animal compared to the one that was around a decade ago. War has kept them busy. It has bruised and battered them, but hasn’t broken their back. The post-Siachen ‘Shahi Army’ of the ‘90s, even early 2000s – ‘PT’ at 0630, breakfast at 0730, office at 0800, out the door by 1600, ‘games’at 1700, with ‘tea breaks’ scattered in the middle – is done away with, they say. What we have now is a hardened CT/COIN specialist with 5,000 deaths that are finally being leveraged with seriously enhanced PR [remember the toll surprisingly circulated by ISPR last week: 308 civilians, 114 military, 38 police killed since the APC of last September] and sustaining a robust pro-democracy brand that still lets the army enjoy being a think-tank, a spy network and a foreign office all rolled into one. Yes, Military Inc lives. Yes, they still think that some proxy warriors make for an excellent tool of state ‘ideology’ and policy. Yes, the Balochistan narrative isn’t under their control. Yes, the ISI is still up to its not-so-funny business; but the R-word – ‘rogue’ – now brings about immediate paranoia in Aabpara where, for a change, the mention of slain journalist Saleem Shehzad is more groan-inducing than it is growl-producing. Thus, though they’re not supremely on top of the food chain, it can be said with certainty that, for now, the army is all set to achieve its primary, tactical goal for the first quarter of 2014: winning the war for the war. That’s why the strafing and bomb-runs are not shattering the system, nor causing a market collapse or triggering an existential debate (nobody cares about the noise the JI makes anyway, and even the PTI has learnt to zip it since the massacre of the Karachi police commandos, then the FC prisoners). But that’s not the only reason why our chaps are all sorted with their sorties.They did, they believe, genuinely give the peace efforts a go.But, really, the talks were a win-win for both Pindi and Raiwind, whether they would have worked, gone on productively to establish a ceasefire, or not. If peace were achieved via dialogue, then reconciliation – the new Af-Pak buzzword – could be equally trudged towards on both sides of the Durand, which would work out for the new, ‘talk, don’t just fight’ narrative that Islamabad, Pindi, Washington and Kabul (with help from Riyadh and Ankara) have almost banged out in unison. Maybe that’s why the CIA has muzzled its Predators for weeks: if talks could deliver the TTP shura to Pakistan, then perhaps Pakistan would be obliged to help deliver other shuras for the wrapping up Af-Pak. Sub-optimally and more locally, give peace a shot, and both the government and the military would look tolerant and patient, respectively. Plus, the chaps would look fashionably subservient to Mian Sahib and Mian Sahib would look fashionably in charge of the chaps. Alternatively, with peace not achieved after being given a shot (which is where we are at today), the chaps would unleash and bare their teeth. Meanwhile, Mian Sahib would have to scratch their back, as promised, and maybe even polish their fangs. The chaps would look tough. And Mian Sahib would look tough by association. Claim Two: The new swagger and purpose has got something to do with the new chief, who is less of a deliberator and more of a decider: the sort of man who doesn’t sulk in dark corners like his predecessor, but one who comes up to the center of the room, introduces himself, offers a very big hand, compliments your jacket, chugs on about his parent unit, strokes his para-wings and cracks a civilised joke about the weather, or maybe even the cavalry. He is a Piffer, after all. When he came in, we all went on about Gen Raheel’s very limited COIN/CT experience; about how he hadn’t spent a lot of time out West and didn’t know enough about this new front; about how he wasn’t a complex enough man because he hadn’t manned an intelligence tower for the Fortress on 7th Avenue. Retrospectively, we were right about his CV, but wrong about who the war effort needed. As we yearned for an end to the insurgency – via talking the peace talks or walking the warpath, or whatever – the ‘spy-soldier’ model of Kayani wasn’t required. We didn’t need an over-analytical chain-smoking spook, his habits twisted by his Aabpara bout, who would obsess more about checkmating political challengers from Army House than he would about his increasingly antsy formation commanders who were itching for a fight in the field. What we needed was someone who wasn’t afraid to use the night/ISR capability of his F-16 Block52s or the infrared cannons of his AH-1F Cobras over Mirali Bazaar. Or Hasukhel. Or Tirah. Or Thal. Or Hangu. Or Bara. Yes, there would be a cost. Yes, there would be collateral damage. Yes, the mullahs would tweet and scream murder. But Raheel would break the inertia. Peace with the TTP would either be negotiated, or bombed, or strafed. And a tangible, visible objective – the cessation/ceasefire of terror attacks – would be established as an achievable benchmark of security policy by Raheel’s new GHQ. Claim Three: General Raheel Sharif has managed more in three short months than what General Ashfaq Kayani couldn’t figure out in six long years: to be able to brag – genuinely brag – about being on the same page with the executive arm of a duly elected government, and let the PML-N do so vice versa, too. Yes, Musharraf is a serious sticking point. Yes, there isn’t a lot of congruence about Balochistan. Yes, Karachi isn’t being ‘granted’ to the Rangers like they would like. And of course, the red-line of “trade mangoes, not sovereignty” with India has embarrassingly restricted Raiwind’s MFN with New Delhi. But the show goes on. And it’s looking like a Nawaz-Raheel co-production, of sorts. Claim Four: The war isn’t coming; the war is essentially here. The codename of the operation has already been chosen, too (more on that, soon). The use of Army Aviation and PAF in air strikes is dual:’softening up’ targets before committing to a ground assault, as well as gauging the national barometer for the combat to come. That last bit of insight from the younger officer is key. And that is why the brass is concerned and emphatic about post-battle rehabilitation. Claim Five: This ‘mop up operation’ in NWA is over-hyped. The space the TTP and Co have won in the national narrative makes them look larger than they really are. It’s not the Taliban we need to be worried about. It’s the long war against extremism that not just the army, but the government and the country will have to fight. “Especially the provincial governments,” specified a ranking military officer, hinting at the one and only PTI. Regardless of the politics, it’s ironic that a top military source made this claim. But that’s the beauty of the Pakistan Army. They were the first to really screw-up on the extremism front, but they’re now leading the charge to fix it. It’s the classic case of the heart surgeon who smokes himself. But this heart surgeon claims he’s done smoking, and we should quit, too. The XI Corps: In another world and at another time, this was one of the smaller formations the army had. But the XI Corps has now swelled up to become the largest one in the country, with at least seven divisions working under it. The Divisions: Each division has around three to four brigades, with each brigade having around three to four units, and each unit has around 800 or so men in it (it depends on the arms, fighting or supporting, involved). The ISPR claims over 150,000 troops are committed to the western front, compared to less than 100,000 on the eastern front with India. The main combatant inside North Waziristan is the 7th Division. Also called “The Golden Arrow”, this is a strike formation actually based in Miranshah, and the oldest division in the Pakistan Army. So far, the 7th has kept Pakistan’s flag fluttering in NWA, though they’ve been listening more and fighting less. The 9th Division, headquarted in Wana, will cover the southern corridor through the Razmak axis in South Waziristan when the militants start doing what they do best: moving from NWA into SWA. The 40th Division, forward-based in Jandola, South Waziristan, will cover the southeast. They will also protect mainland Pakistan and Punjab from penetration when the operation triggers population movement. The 37th Division, a leading strike division, will come from Swat/Shangla, and could be supported/alternated by another strike formation, the 17th Division. These will be “on rent” from the I Corps, in Mangla. The 19th Division (covering Orakzai, Khyber, Bajaur) that watches the northern axis will come from ‘the top’.The 45th Engineering Division, already in the mix with elements of the FWO, will provide operational and post-operational support and ‘rehab and rebuild’ for the transfer stage. The Frontier Corps KP, which is a division-sized formation, led by a two-star major general like all the other divisions, is made up of local Pashtun tribesmen and commanded by Army officers; a spearhead in the war so far, but also heavy hit and still lacking the standards of the regular army, they will assist throughout the region, especially the borders. Dedicated aviation assets, like MI-17s for heli-borne assaults for airborne attack elements and AH-1S/F Cobra gun ships for close air support (CAS) will be provided by the XI Corps. Meanwhile, PAF will provide air-to-surface protection from its various air-bases, particularly assets based in Peshawar.Thus, the war will begin. Or perhaps even end.